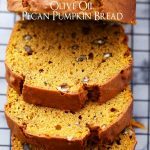 Olive Oil Pumpkin Bread Recipe | Easy Pumpkin Recipe for Fall Baking! 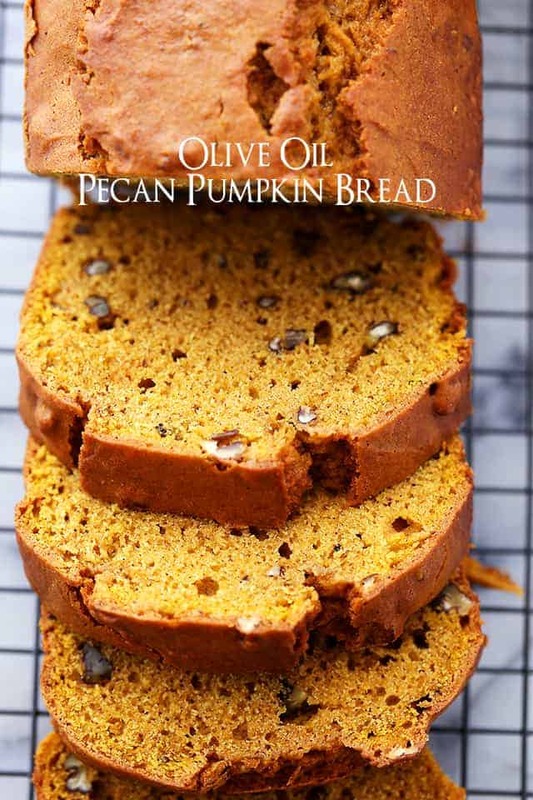 Olive Oil Pecan Pumpkin Bread – Rich and flavorful, easy to make pumpkin bread with olive oil and pecans. 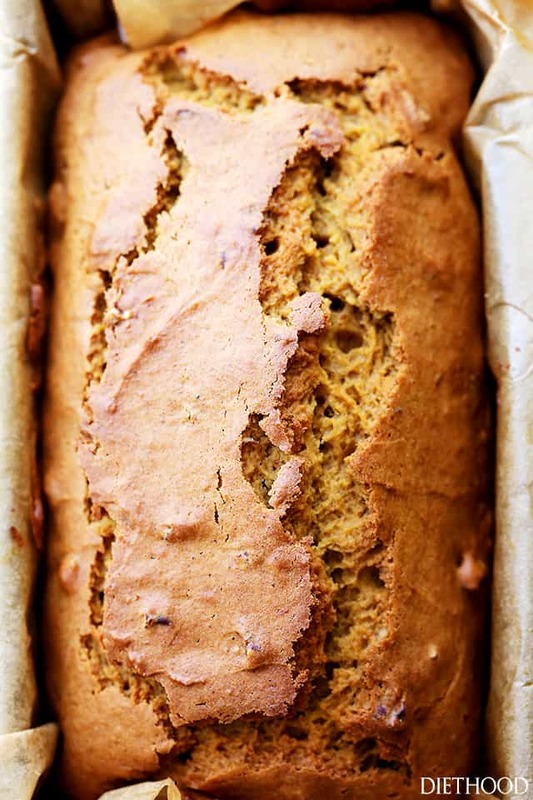 A.K.A Your new favorite Pumpkin Bread! A.K.A. The pumpkin bread that’s coming with me on Thursday. Hey Hey, buddies! Happy Thanksgiving week! More importantly, Happy SHORT working WEEK!! Well, unless you’re in retail, then, uhm, forgive me? So, how was your weekend? I had BIG plans, but the dang snow that decided to greet us on Saturday forced me to stay inside and hang out with Kendall Jackson… I ain’t complainin’. As long as we’re being honest… I didn’t get out of my pajamas on Saturday, either. I put on a fancy robe over them because I needed to at least feel fancy while hanging with Chardonnay. But that was about it. YAY ME! However, things are about to get way fancier up in hurr! We’ve got this pumpkin bread to discuss aaaaand the fact that it’s made with STAR’s Butter Flavored Olive Oil! Now you can enjoy the flavor of butter AND all of the health benefits of olive oil in ONE! 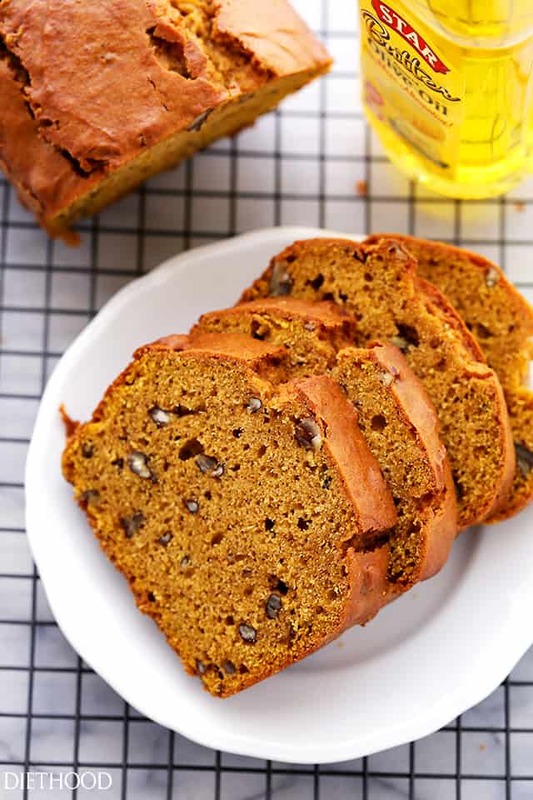 In fact, you can substitute STAR’s Butter Flavored Olive Oil for butter in recipes for baked goods, such as this pumpkin bread, or use it to make my Spaghetti Beef Casserole. As soon as cold weather hits, I’m pretty much preoccupied with baking AND pumpkin. Ob.sessed would be a more accurate description. And, as I’m making pumpkin muffins, or pumpkin bread, I’m also separating couple of tablespoons of that pumpkin puree to make Pumpkin Spice Latte. …I just said “pumpkin” 6 times in 1 second. Am I talking too much pumpkin, here? Forgive me – ’tis the season. Anywho. FYI? Thick slices are the way to go with this guy. And the addition of pecans? I don’t know if I can ever eat pumpkin bread without them things again. What’s more is that each slice gives off those fall crisp flavors that we all love so much, and it goes perfectly with a cup of EGGNOG! Scouts honor. It tastes GREAT! Oh yeah, I’ve already opened up the eggnog. HEY, don’t judge, boo-boo. Target has had Christmas decorations up for like 2 months now… getting ahead on my cup of eggnog only a month before Christmas ain’t too bad. also also?? You can freeze this beauty for up to 3 months. OR you can make it this Wednesday night and have it ready to be torn apart on Thanksgiving Day! Just trying to help you out with the menu, that’s all. 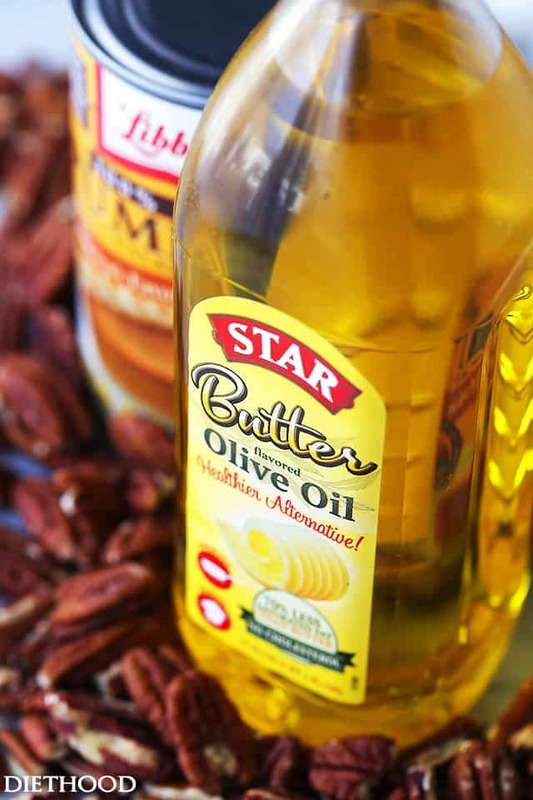 STAR Butter Flavored Olive Oil is available at select Savemart, Raley’s, Stater Bros. and Food Maxx stores and ONLINE. Grease a 9-inch loaf pan with baking spray and set aside. Place flour, baking soda, baking powder, salt and spices in a large mixing bowl; whisk until well combined. Set aside. In a separate mixing bowl, whisk together sugar and olive oil; whisk until well blended. 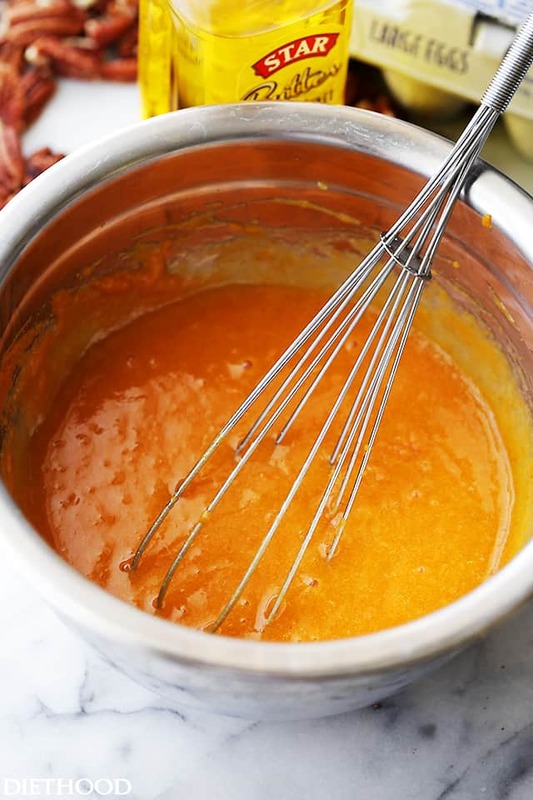 Add eggs, pumpkin and vanilla; whisk until thoroughly incorporated. Add the pumpkin mixture to the flour mixture and, using a wooden spoon, stir until combined. 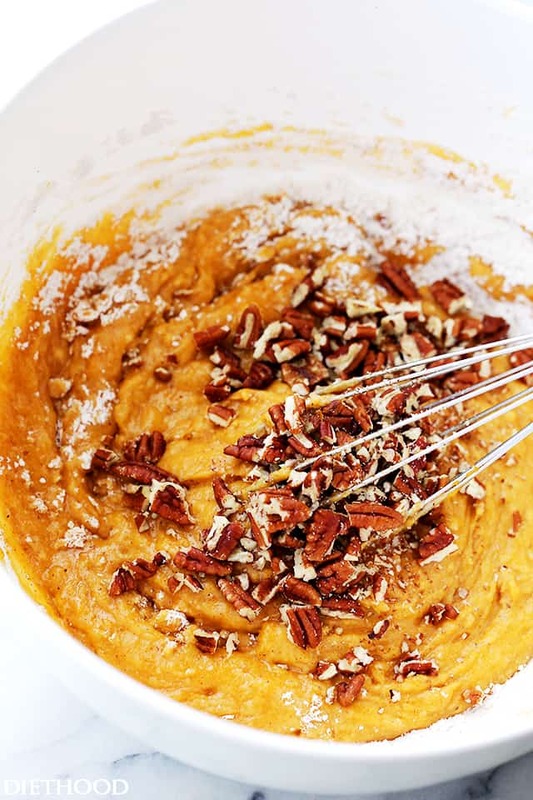 Stir in the pecans and let batter stand 15 minutes. Pour the batter into the previously prepared loaf pan. Bake for 1 hour and 10 minutes, or until a toothpick inserted into the center of the loaf comes out clean. Cool in pan for ten minutes; turn the bread out onto a rack and cool completely. Cool the quick bread completely before wrapping and freezing. To freeze, wrap securely in aluminum foil and place in freezer bags. When ready to bake, thaw completely at room temperature before baking. Girl, this bread is gorgeous! Olive oil must make it the best! I need this bread in my life! Love baking with olive oil. That snow ruined my plans too. I’m already tired of winter. I hope you had a great Thanksgiving! I love using olive oil for my cakes. A much healthier alternative than butter. Your pumpkin bread looks terrific. So moist and yummy! Oooh olive oil that tastes like butter sounds like my kind of cooking oil! This bread is so gorgeous, I wish I had a big hunk of it to snack on right now! What a clever way to use olive oil! I’d love to get my hands on some of that butter flavored oil… So many uses! I’ve baked plenty with olive oil, but I’ve never even heard of butter-flavored olive oil before. I will definitely be ont he lookout. Thanks! This bread makes my dreams come true! Just beautiful. HAPPY THANKSGIVING friend! I have never baked with olive oil but I’ve seen so many recipes with it lately that now I want to try! Pumpkin bread is one of my favorites. 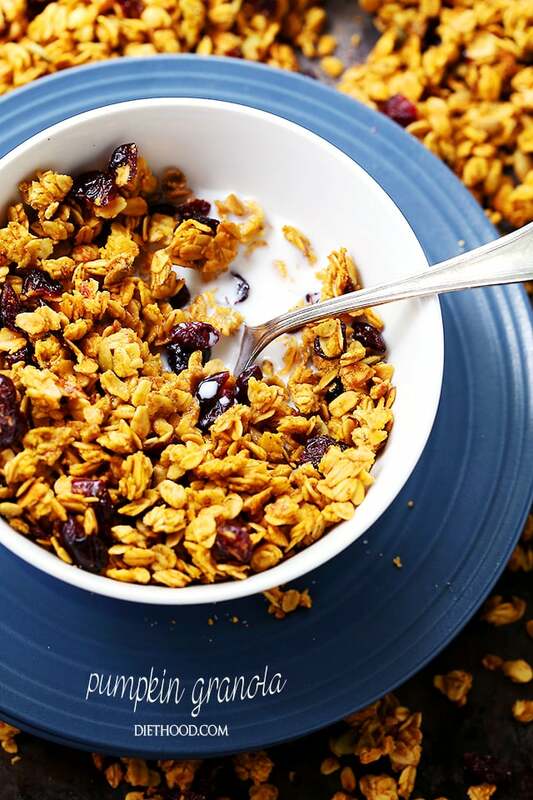 I can’t wait to try this recipe and see how moist it turns out with the olive oil! 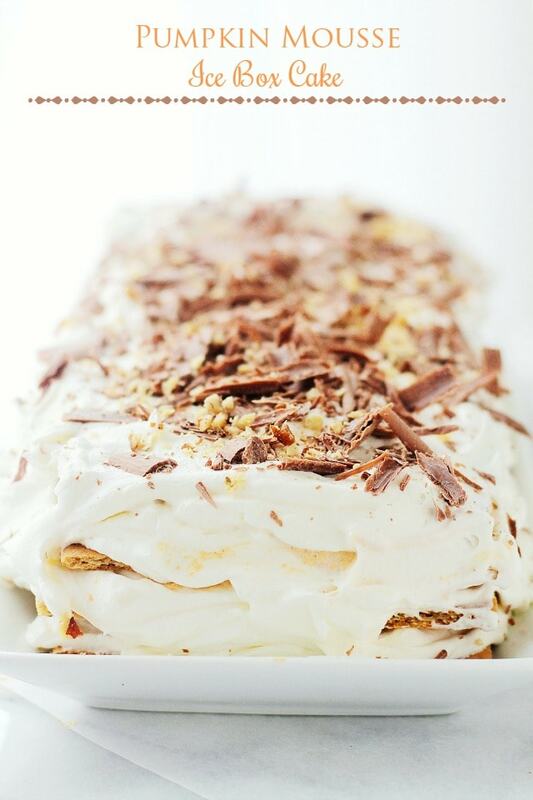 This is one gorgeous pumpkin bread. Hope you have a wonderful Thanksgiving.